Finally, I think I’ve got it right. Decades ago I grew this rose true to name. But that plant, after blooming and proving its identity, developed canker and was removed. Two successive acquisitions proved to be false – and although ordered eight years apart from the same supplier proved to be the same false plant. The one you see above arrived only a few weeks ago and has already produced a small flower. It’s the real thing. Helen Van Pelt Wilson, in her book Climbing Roses (Barrows, 1955), mentions that the blooms of this rose are very lasting. We had a good demonstration of that this week: the flower has come through several days with temperatures over 90 degrees F. and still seems presentable. Nor has the color faded much. Update July 28, 2017: the flower was still in fairly good condition on July 25. On the 26th, the petals turned brown but did not fall - they dried in place. I think it’s fair to say that this is one of the most famous roses of all time. 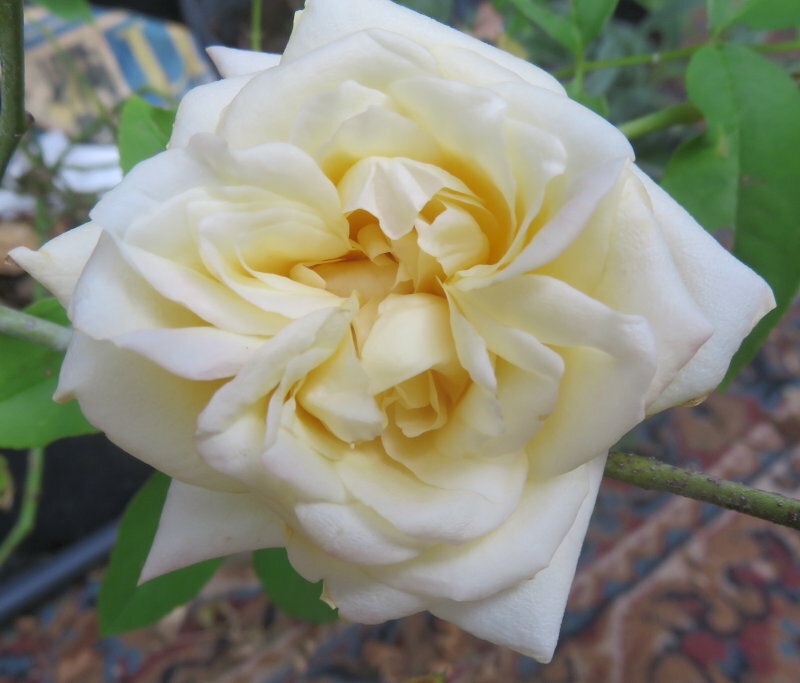 Its name appears in the pedigree of many other famous roses, although given the likelihood that hybridizers of the past and present don’t always tell the whole truth in these matters, perhaps such claims need to be taken with a grain of salt. But of its fame there is no doubt. I’ve read that in the nineteenth century so highly was it esteemed that greenhouses were built specifically to house this plant. It’s not really a garden plant in our climate. Mrs. Wilson says bluntly that it is not hardy at Philadelphia. And Mrs. Keays, in her Old Garden Roses, did not find it in her searches of southern Maryland gardens. Here in the greater Washington D.C. area plants have been known to survive for a few years, only to break the gardener’s heart when we have one of those winters which gets the global warming deniers braying “I told you so”. But if you’re my kind of rosarian, you’ll at least want to try it once. Somewhere I read of an early twentieth-century gardener in West Virginia who grew it by taking it down in the winter and erecting a cold frame around it for winter protection. A green house is out of the question for me, but a cold frame is not.